Jane’s Bay is a 24 in. x 24 in. acrylic on canvas painting by Bev Hogue. 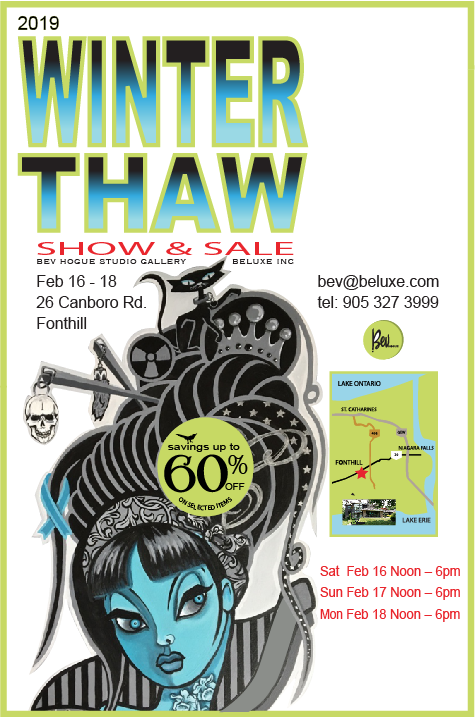 The annual Winter Thaw show and sale features Bev Hogue and Beluxe products. Come by for a visit Feb. 16, 17 or 18 at 26 Canboro Road in Fonthill. Noon to 6 p.m.
Bev Hogue’s annual winter show and sale is on the long weekend — Feb. 16, 17 and 18. Noon to 6 p.m., Friday, Saturday and Sunday. See you at 26 Canboro Road, in Fonthill. It’s an exciting weekend ahead. 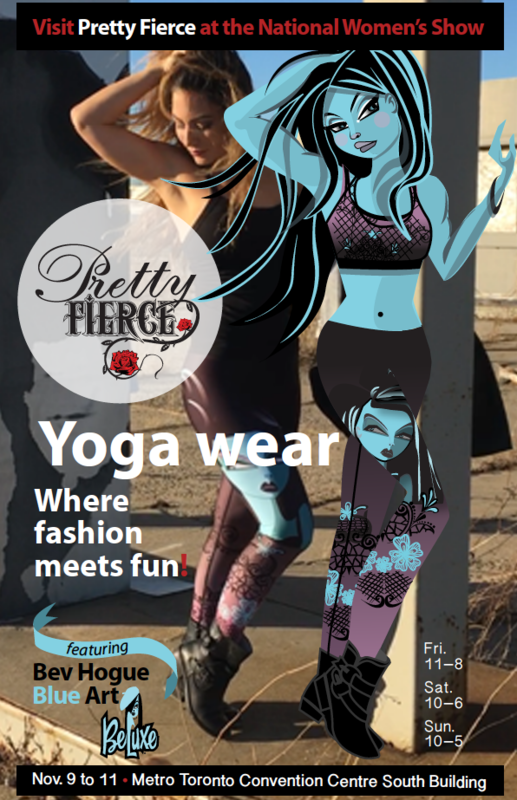 The launch of Pretty Fierce/Beluxe yoga wear is on at the National Women’s Show at the Metro Toronto Convention Centre, Nov. 9 – 11. Visit booth 1204 to see all the styles. Some fab moments are put together in this video that visually connects Beluxe and Pretty Fierce. 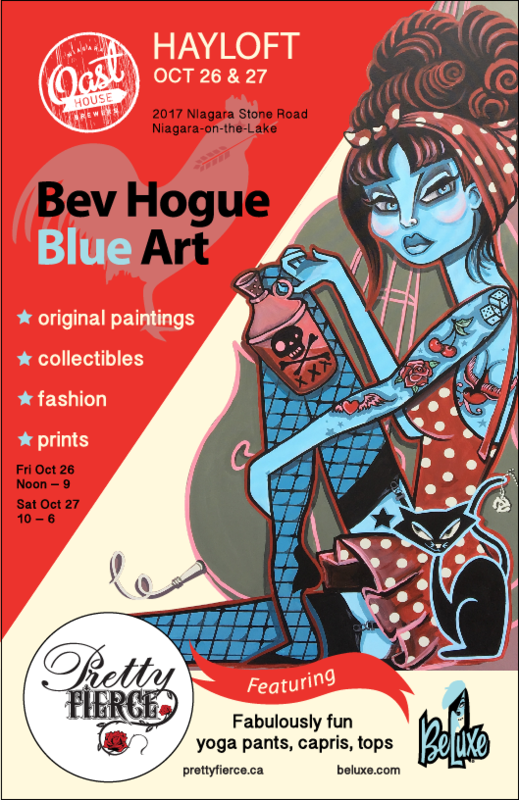 A striking new series of Bev Hogue “Blue or Nothing” paintings and yoga gear with Pretty Fierce are featured Oct. 26 and 27 at the Oast Hayloft in Niagara-on-the-Lake. 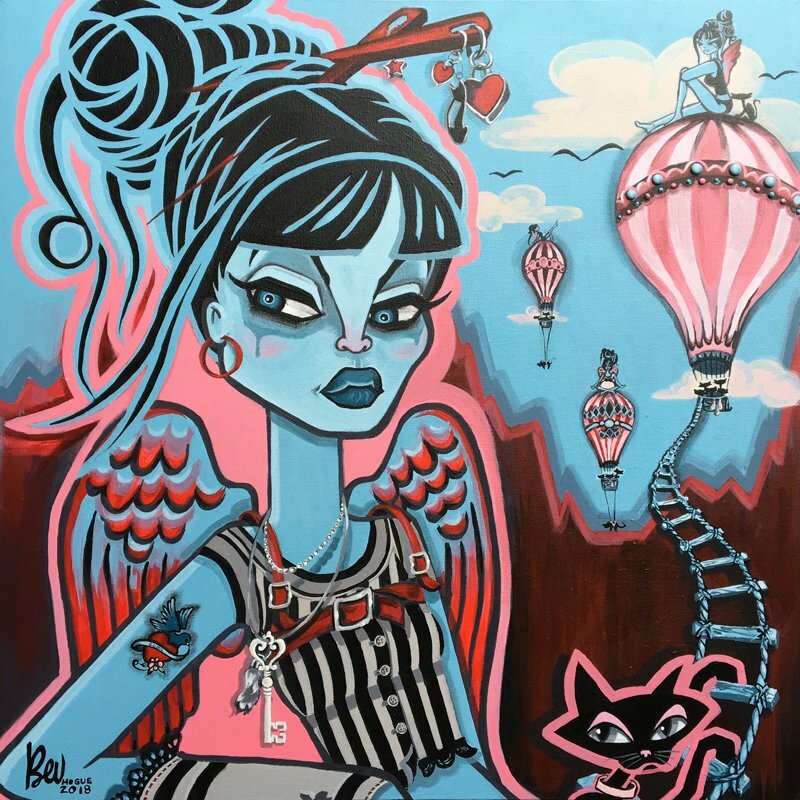 The famous blue paintings of this highly collectible Niagara artist blend fantasy and fashion in the pop surreal genre. 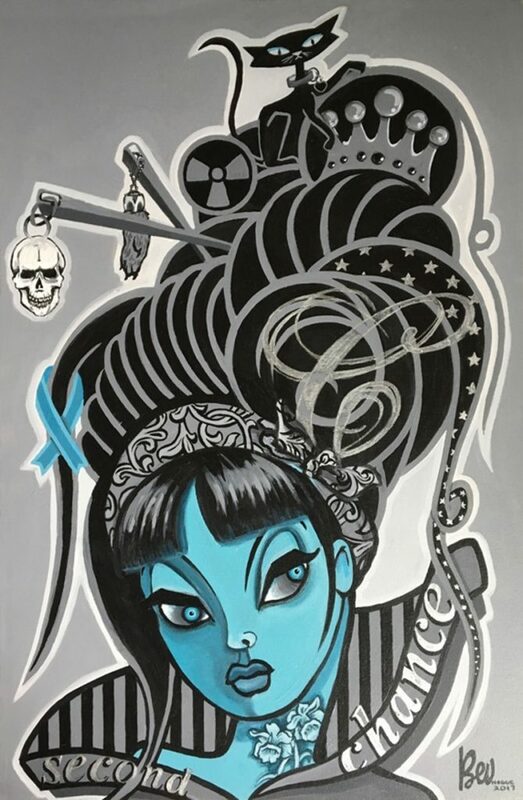 And through her Beluxe label, this bold imagery is distributed worldwide on clothing, jewellery, shoes and accessories. The natural next move was for Bev to partner with Canada’s own Pretty Fierce with a line of yoga pants and tops. See the latest styles at the launch in late October. 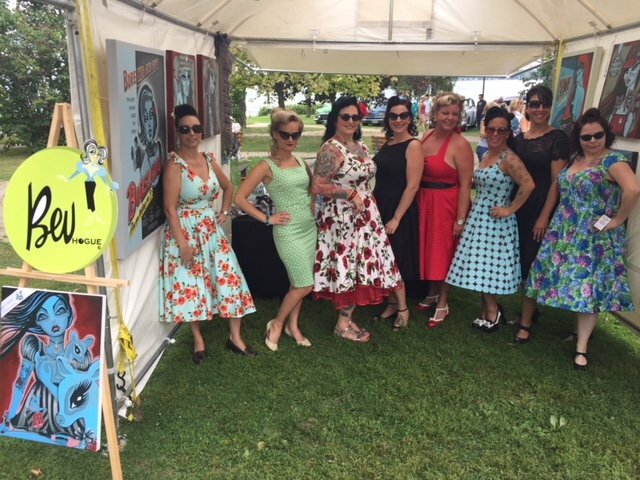 We made some new friends at the Red, Hot and Blue rockabillly fest in Brockville. Nathalie, Amund, Dave, Heather, Claude, Craig, Trev and Debbie — you made us feel most welcome. Already looking forward to next year’s show on the Thousand Islands shore. 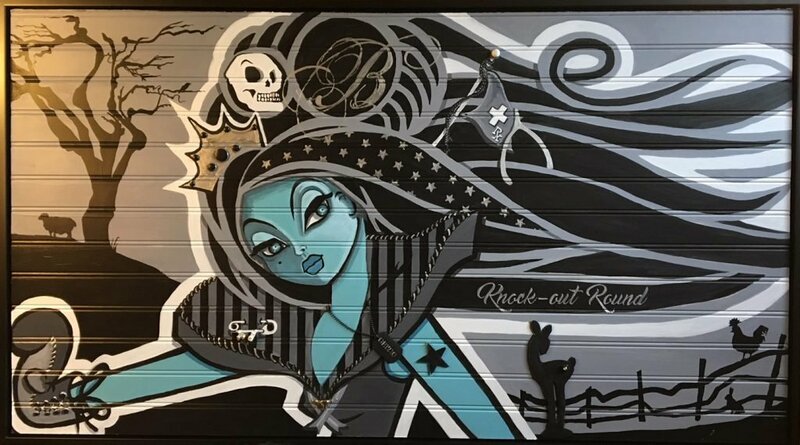 And we are proud to announce that the Spitfire is the spot to pick up original Bev Hogue art, collectible prints, and fashion necessities like Pretty Fierce yoga gear emblazoned with Beluxe blue femmes. 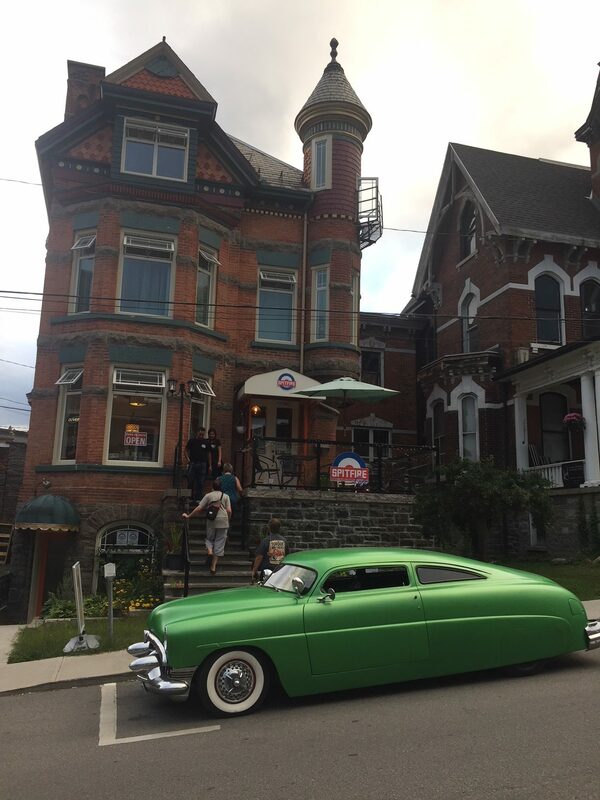 In the Brockville area, contact Nathalie Lavergne at the Spitfire Cafe, 10 Victoria Ave. 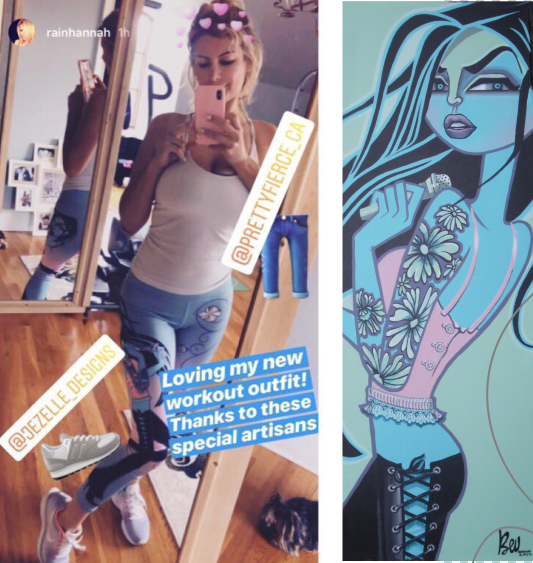 Rain Hannah models some fab Pretty Fierce yoga gear with Bev Hogue-Beluxe art. 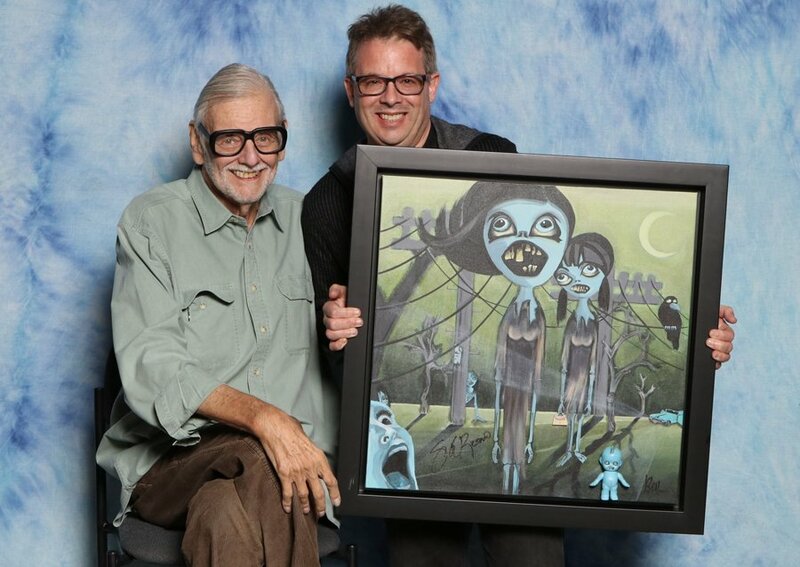 The pants are based on the original Night Moves painting by Bev Hogue. Thanks for the shout-out from Rain. Maybe we will see you fashioned up with them on the Vince Neil tour. You can get a pair here. One of the great things about Beluxe is making connections with a lot of people in a lot of places. 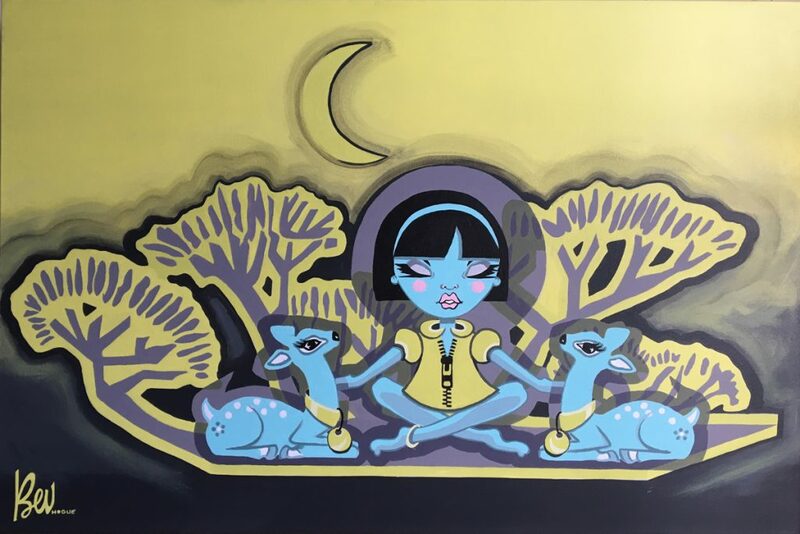 Through exhibits, galleries and trade shows across North America, Europe and Asia, we have met thousands of art lovers and supporters. You enrich our lives and the love is returned. 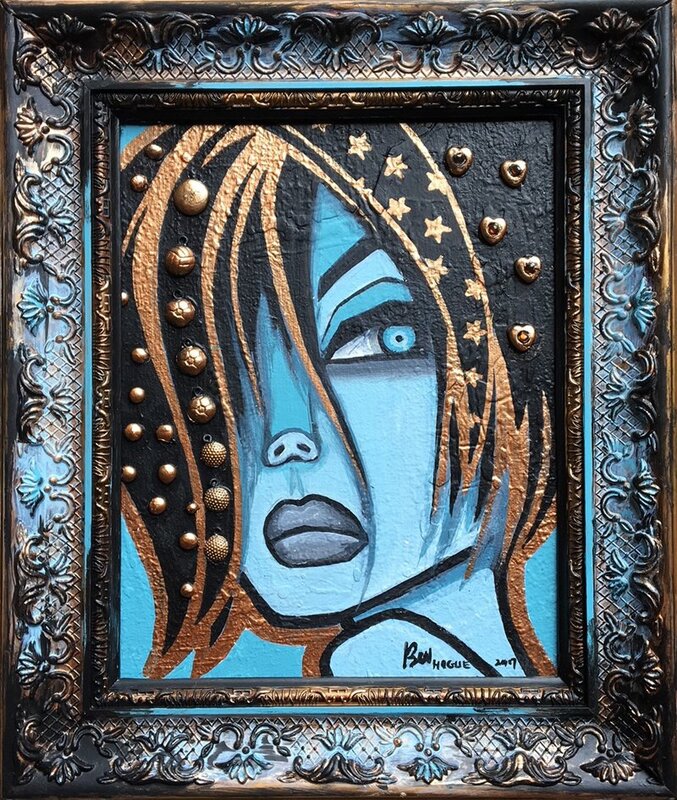 Bev pours back the support by daring to look deeper in her creations. 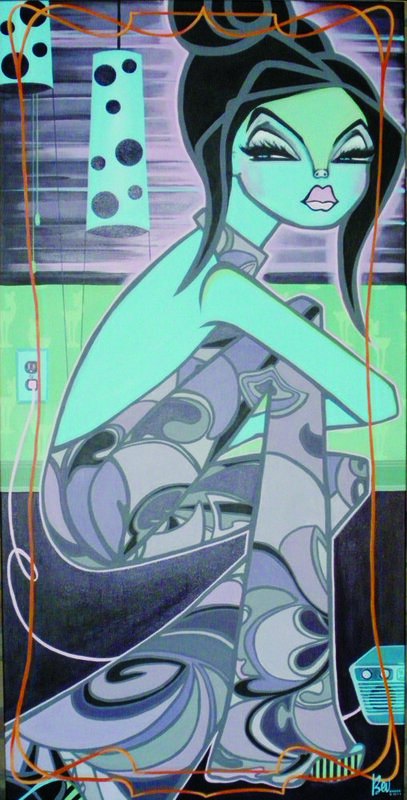 A new series of paintings is under way that we will soon be able to show. Through Beluxe, we have new opportunities to share with a wider audience in exciting new ways. 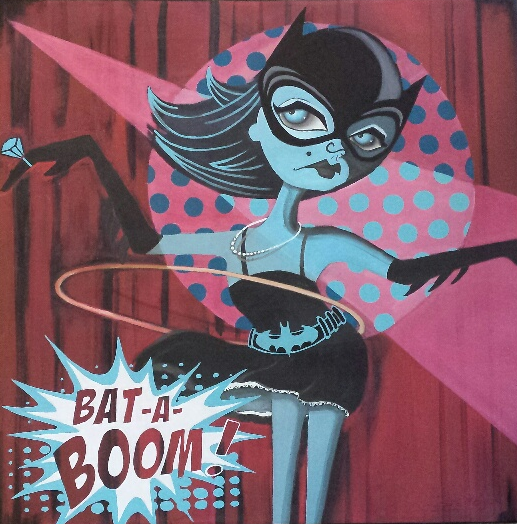 One big example is the special release of a framed piece of art that is available on Wal-Mart. 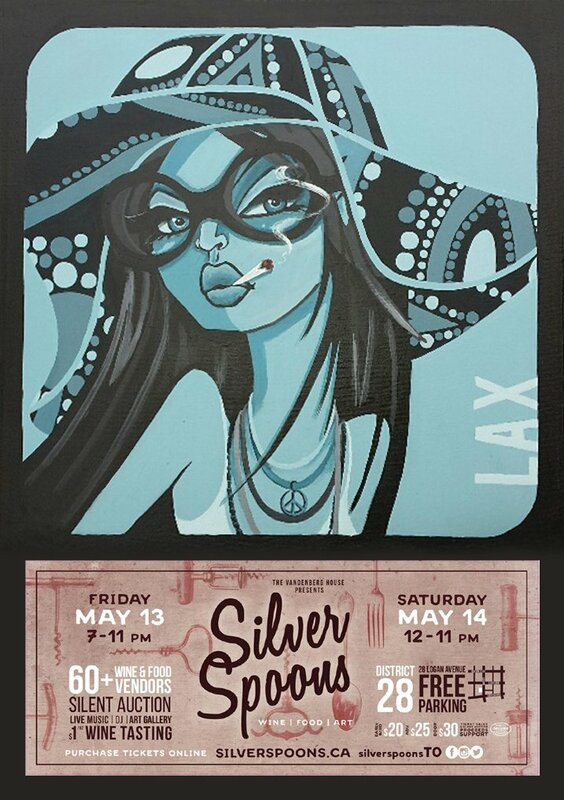 Silver Spoons is an art-wine-food event in the Eastside of Toronto May 13 and 14. 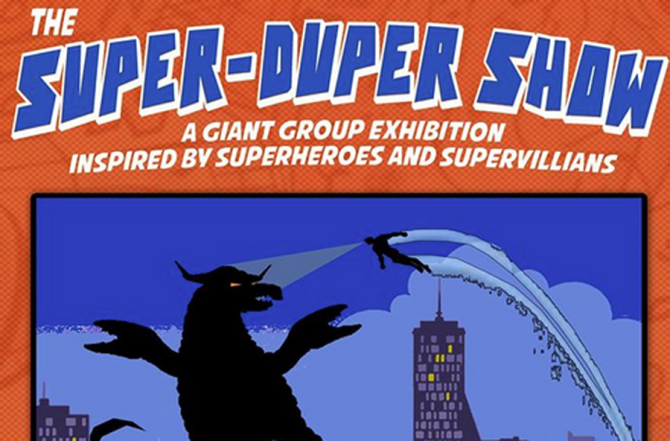 Along with gourmet food, wine and beer tastings, live music, there will be a pop-up art gallery. 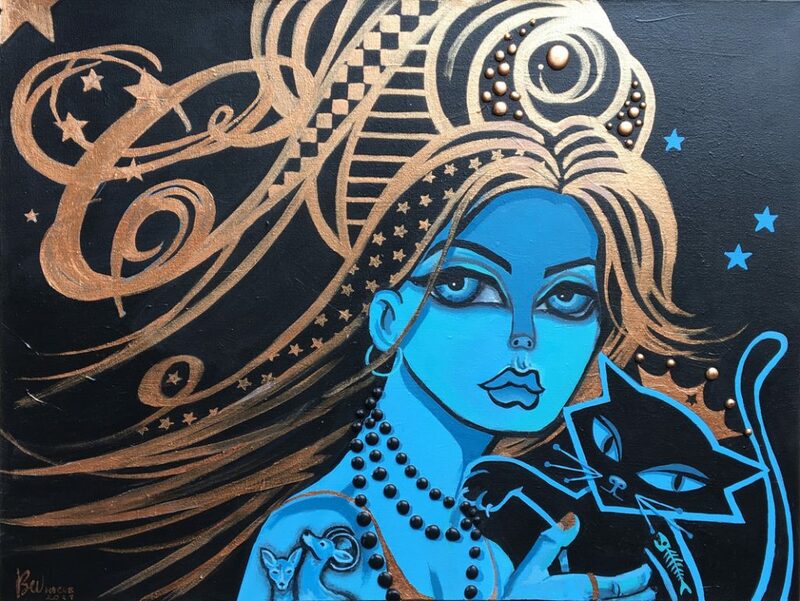 I will have an exhibit of my latest paintings here, so if you are in the city to say hello and see some of my recent work. It’s a great event, with proceeds going to support Second Harvest.